If you’ve spent any time on Twitter, you know that the coveted blue checkmark – which means you’re verified – gives you more credibility and influence with your audience. Twitter introduced verification as a way to help users find high-quality thought leaders and influencers to follow in niche interest areas. You’ll find those blue checkmarks next to the usernames of celebrities, authors, journalists, athletes, and more. Here’s what you need to know about the benefits of getting verified on Twitter and how to join the exclusive ranks of verified Twitter users. That said, Twitter encountered some backlash when verified users were engaging in not-so-nice interactions, and the public at large seemed to be conflating the Twitter verification badge with an endorsement by Twitter – despite Twitter clearly stating that verification does not equal endorsement. In fact, things got so out of hand that back in November 2017, Twitter halted new applications for verification with the goal of overhauling the verification process to create a more “holistic” system. Twitter’s product lead, Kayvon Beykpour, says that while they’re still verifying accounts on an ad-hoc basis, fixing its flawed verification system isn’t top on the priority list at the moment, as the company is “focused on information quality ahead of the elections.” Bottom line: The verification request form is offline at the moment, and likely won’t be back until sometime after the midterm elections. Fill out the Twitter verification request form (currently unavailable). You’ll need a confirmed email address, a verified phone number, birth date, and a completed profile including a bio, profile photo, header photo, and website URL. And of course, your profile must be set to public. Enter the username of the account you’d like to be verified. If you’re asking for a business account to be verified, check the box at the bottom of the screen that indicates the account is a company or business account. If you’re missing some of the requirements mentioned in step one, you’ll get a screen that says your account isn’t eligible for review. At this point, you can fill in the required information and resubmit. Submit websites as references. Twitter asks for up to five websites that can be used to verify your identity. These can include links to articles you’ve written, links to mentions in the news, and anything that serves as proof of your influence in your niche. Build your case for verification. In this step, you get 500 characters to convince Twitter why they should verify your account. Yes, we know, that’s not a lot of space. That just means you need to weigh your words carefully and put on your best sales-copywriter hat. You might want to mention major achievements, instances when you’ve made waves in the news, or how long you (or your company) has been in your industry. Review your information and submit your verification request. Before the final option to submit your request, Twitter gives you a chance to review all the information you’ve entered. Take the opportunity to look for any errors or mishaps that could hinder your chances before you hit submit. If your request is rejected, you’re able to apply again in 30 days. If verification is granted, keep in mind that behavior matters; Twitter reserves the right to revoke verification for anyone violating Twitter’s terms and conditions. 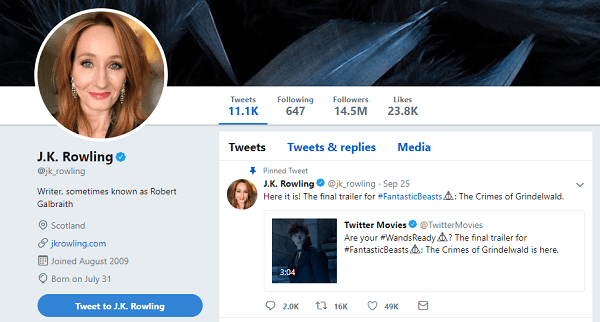 Given that it’s not possible to request verification at the moment, the odds of being verified if you’re not, say, J.K. Rowling, are pretty slim until Twitter re-opens verification requests. That said, you can certainly take some steps in the meantime to make your Twitter profile verification-worthy. Be active. Tweet often and engage with other users. Post a mix of content by retweeting other users’ posts, your own content, Twitter GIFs, images, and more. Perfect your bio. Make it clear who you are and what you do, as well as the benefits you bring to your followers (like your glowing personality). Build your followers. Accounts that have a few hundred followers may have a hard time making the case that they’re in the public interest. So, install Twitter follow buttons on your website to grow your follower base. Don’t buy followers. While it may be tempting to get a few thousand followers quickly by buying them, it won’t look good if 90% of your followers are fake accounts. Not to mention, fake accounts don’t tend to engage with you, nor do they actually have an interest in what you have to offer. There are plenty of organic ways to grow your followers without resorting to this tactic. Connect with verified users. Who you interact with can say a lot about who you are, so it certainly doesn’t hurt to get connected with users who have already earned that sought-after verification badge. Do so by retweeting their content, commenting on their tweets, and engaging in friendly conversation. Follow the rules. Given that rule-breaking was a big part of what led to Twitter’s verification controversy, it’s a safe bet that you won’t get verified if there’s any evidence of you violating the terms and conditions. That doesn’t mean try to hide it; it means don’t do it. Period. While it’s a bummer that you can’t directly request verification for the time being, that just means that you have some time to improve your visibility and make yourself a prominent thought leader – so when it’s possible to request verification again, you’ll be a shoe-in for that coveted badge.